I’m going to skip the 35E River Bridge – officially the “Lexington” Bridge. Who cares? After the 35W River Bridge collapse, Amy Klobuchar famously remarked that bridges just don’t fall down in America. But if you read the history of the Smith Avenue High Bridge, you’d realize she should have added “But barely”. First things first; when I show people the Twin Cities at night, there are two views that are were topmost on the agenda; the first was always Minneapolis, coming into town from the north on 35W at night. 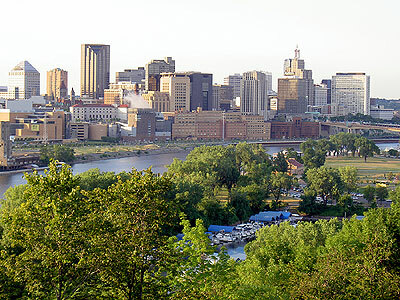 The second, always, was downtown Saint Paul viewed from the south side of the High Bridge. The vista of downtown in all its warm, brownstone glory is really stunning. Claim to fame: the ornamental iron work is made from iron salvaged from the old bridge that this bridge replaced. At 160 feet tall, it is the highest bridge in St. Paul. The old high bridge was made of wrought iron, and opened in 1889. A storm in 1905 destroyed part of the bridge, which was rebuilt using mild steel. It was a spindly looking structure that looked more like it was made out of metal toothpicks. The bridge closed in the 1980’s, and was imploded in 1985. I moved to town not long after the old high bridge was demolished. Now, moving from a part of the country where hardly anything was 100 years old, the notion of a working bridge being that old was kind of scary – especially when you actually got a look at the thing (and they are hard to find, although this neighborhood association page does have some photos of the old bridge – which does, indeed, look like one of those engineering-club toothpick projects). The new bridge opened in 1987, and was heralded as one of the seven engineering wonders of Minnesota. The huge steel supports under the bridge looked like a giant letter W, with the two bottom points sitting on piers, and the center forming a large steel arch. As soon as it got cold, the bridge contracted a little more than was planned, and one of the steel sections shifted, causing the center point of the W to no longer meet. Instead, the two beams shifted 11 inches, leaving a huge drop-off on the bridge. The bridge was closed several months while engineers designed a way to move the arches back into position and remove the ski-jump from the roadway. Note to Amy Klobuchar; it wasn’t the Third World. Note to Nick Coleman; who was the governor in 1985? A newspaper account from January 22, 1962, states that a car left the old high bridge, landed upside down on a telephone line, was sprung back up into the air, and landed upright with no passenger injuries. I guess that is what makes winter driving so much fun in Minnesota. Can’t vouch for the story, but if you’re afraid of bridges, the High Bridge – history aside – is a tall order to swallow. I had to take a Statics class where we built similar structures. There’s a reason engineers do that: to show you how good design can make even poor materials do remarkable things. Back before Civil Engineers took up computers they tended to emphasize the design more heavily than the materials engineering. Now they tend to do more with materials, but they don’t have as good a handle on that as they do the design (as you can note from “As soon as it got cold, the bridge contracted a little more than was planned, and one of the steel sections shifted, causing the center point of the W to no longer meet.”). The emphasis on materials engineering is a shame, since the design of the older style was more pleasing. how good design can make even poor materials do remarkable things. Reading Ambrose’s “Nothing Like It In The World”, about the transcontinental railroad, talked about the huge, long, high truss bridges the railroads built using nothing but local wood. They stood for decades, some of them. Hell, yeah! I love that view. That’s my ‘hood, and the view at night is awesome – it makes St. Paul look like much more than it really is. Sweet post. This is my gateway to Hell every morning! Strange, I thought that was when you opened the MinnieMousiter.